Natural rubber is one of Thailand's most important agricultural products, designated a 'critical material' by the European Union; but also one of its most complex. 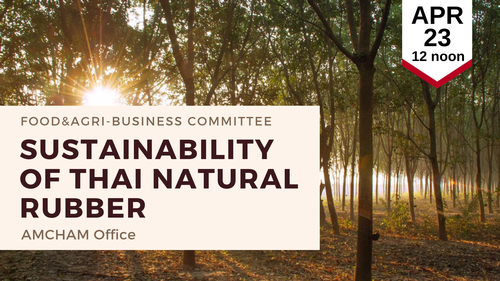 Price volatility, chemical treatments, excess supply due to the China slowdown, government interventions, farmer protests, brokering ethics, and other issues within the natural rubber supply chain have made the news in recent years and place natural rubber sustainability questions at the forefront of Thai agro-industry. Ms. Maiprae Loyen of MTI-Solution Co., Ltd. will present to the Food and Agriculture Culture Committee on the continued importance of natural rubber, the challenges faced by farmers, and how technology, big data, and informatics can help Thailand remain the global supply leader while ensuring sustainability throughout the natural rubber supply chain. Members: Free admission. Sandwich lunches may be ordered for 200 THB.